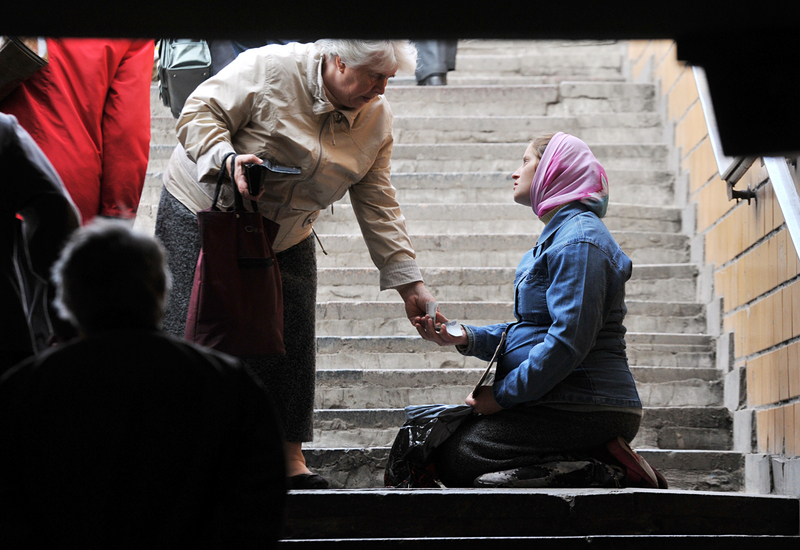 A woman begs in one of the subway underpasses in Moscow. Russians are quickly losing their accumulated assets amid the ongoing economic crisis, and social stratification within the country is increasing. According to official forecasts, the welfare of the population will recover only in 2018. At the same time, authorities will seriously begin thinking about raising the retirement age and taxes. The standard of living of Russians has dropped sharply, by 14.4 percent, during one year, from mid-2015 to mid-2016. Within 12 months, household assets have decreased from $12,086 to $10,344, a study called the Global Wealth Report, conducted by the Swiss financial corporation Credit Suisse, has showed. High oil prices in the years between 2000 and 2007 ensured that the welfare of citizens increased eight-fold. In 2007, this growth slowed down, becoming irregular, and then stopped altogether, before heading downwards. Analysts at financial institutions also recorded an increase in the social chasm, between the wealthy and the poor. In Russia, 89 percent of public wealth is controlled by 10 percent of households. This is one of the highest rates in the world. In comparison, the figure is 78 percent in the USA, and 73 percent in China. It could be that Credit Suisse, in its report, did not take into account some specific features of the Russian economy. Foreign researchers do not always take into account the role of real estate in the country. Very often, the poor live in luxury apartments located in prime locations of major cities. For many Russians, selling their property to improve the quality of their lives is difficult to do, because of their sacred attitude towards their living quarters. They do not see an apartment as a source of potential capital, but as the very purpose of their existence. “The main asset of the population in our country – is housing. Now we are in an economic recession, and the housing market is very sluggish. Fewer transactions are taking place, and as a result, the prices indicated in the statistics are not, shall we say, entirely accurate. Statistically, inequality is caused by the huge differences in housing prices between Moscow and other cities. People living in a studio apartment in the capital, are five times richer than those who are living in a similar premises in the region,” said Alexander Burdyak, senior fellow at the Institute for Social Analysis and Forecasting RANHiGS under the President of Russia. One of the causes that has also led to the reduced quality of life in Russia, according to Credit Suisse, is the devaluation of the ruble. In 2007, the US dollar was worth 25 rubles, and now, nine years later, it is worth 64 rubles. “This sharp drop in living standards was due to the lower exchange rate of the ruble, as at Credit Suisse does all its calculations in US dollars. In other countries, the local currencies have not dropped as much against the US dollar, as the ruble has in the last year or two,” said Burdyak. According to the study, total assets held by Russians amount to trillions of dollars. It is not clear how they calculated prices for residential real estate, which is the main property of the overwhelming majority of Russians. According to official statistics, calculations show a very different picture. According to the Ministry of Construction, in 2015, the country’s housing stock surpassed 3.4 billion square metres, and the average market price of one square metre was 36,000 rubles. Multiplying these numbers and dividing by the average US dollar exchange rate, we get a total value of residential real estate at the disposal of the Russians at around $1.8 trillion. To this, we can add deposits in banks accounts ($360 billion). Finally, there are investments into securities, mutual funds, foreign real estate and other assets abroad. This gives additional hundreds of billions of dollars. The Boston Consulting Group, for example, estimates the volume of Russian assets at $1.4 trillion. However, regardless of the manner in which Credit Suisse came to their conclusions, one thing is clear – the population is losing money, and the gap between rich and poor is growing. Moreover, the situation will only worsen. According to the forecast of the Accounting Chamber, approximately 20.5 million people will be living below the poverty line in Russia by the year 2019, which is 1.4 million people more than 2015. The fact that devaluation of the ruble has become one of the reasons for the sharp decline in the people’s standard of living, was also declared on November 22, by the Presidential adviser Sergey Glazyev. “No country in the world has seen such a high volatility of their national currency in recent years. It is twice greater on this indicator than that of our neighbour Turkey. We also set records when it comes to currency devaluation, including among the oil-producing countries,” said Glazyev. “I agree with this Credit Suisse data, and I even think that they have somewhat embellished them. In Russia, it is not one-tenth, but three percent of the people who own most of the Russian economy. The reason behind this is the colossal difference in incomes,” said Nikolay Kolomeytsev, the First Deputy Chairman of the State Duma Committee on Labour, Social Policy and Veterans, in an interview with Lenta.ru. Kolomeytsev said there are several ways to combat this high social stratification. First, we need to implement a progressive taxation system. Secondly, we need to restore the state monopoly on alcohol production. However, a simple redistribution of the tax burden is unlikely to solve the problem of poverty and social stratification. This can be achieved only by sustained economic growth. And there have been some successes here. The economy is starting to leave the shocks behind it, and is adapting. In 2017, the GDP is expected to grow. The Ministry of Labour is predicting that, by 2018, the incomes of Russians will return to their pre-crisis levels. On the other hand, in 2018, the government will start to actively discuss issues of raising the retirement age and the tax burden – and these measures could nullify the slowly improving public welfare. “In tsarist Russia, and in the Soviet Union, the state had a monopoly on alcohol production. This eliminated the possibility of poisonings, and brought in more income to the treasury. We need to restore state control over the production and sale of alcoholic beverages. Alcohol, if it comes under control of the state, should provide an additional four trillion rubles of revenues for the budget. The progressive taxation system – another five trillion,” he estimated.